This book is a call for others to stop waiting on the best circumstance before acting with mercy and compassion. Helping others is not just for the rich; Everyone has the chance to show love and empathy to the people they cross paths with. Author Marta Montalvo-Ramos has released her inspiring, easy-to-read guide to shifting one’s mindset away from negativity and toward compassion and bringing joy and positivity into others’ lives as well as one’s own life through acts of service, no matter how small. 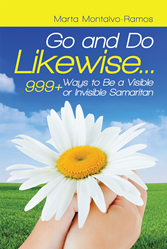 In “Go and Do Likewise… 999+ Ways to Be a Visible or Invisible Samaritan,” Montalvo-Ramos implores readers to change their own thinking, focus on the good in others, and find ways to refocus when a toxic situation overwhelms them. Ultimately, Montalvo-Ramos hopes to share with readers the healing power of grace, hope, and faith and unburden them from the fear and discouragement that has held them back in the past. Packed with simple ideas to bring more kindness into everyday activities like shopping at the grocery store or attending family events, “Go and Do Likewise” offers opportunities for people from all walks of life to inject more kindness and compassion into their day-to-day interactions with people and is focused on showing readers how they can think creatively about taking time to help others, regardless of how many dollars they have in their wallet. Marta Montalvo-Ramos is a child of God who has experienced the rewards of proactively helping other people and is a first-person witness to the effects giving can have on a person’s soul. In her own life, Montalvo-Ramos has seen both herself and others be blessed in many ways by simply keeping her focus on God and on engaging in acts of service at any chance she gets. She currently resides in Davenport, Fla.